China and Saudi Aramco instigated two significant shifts in their bond markets that will impact global investors. First, Bloomberg has begun including Chinese government and bank bonds in its primary global bond index, one which should cause potentially trillions of dollars to shift to that market. Per Moody’s, a phased inclusion of 363 securities by Bloomberg into its index over the next twenty months could channel $2 trillion into China’s on-shore debt market, joining $250 billion already owned by foreigners. Totaling $12.42 trillion, China’s bond market is the third-largest globally after Japan ($12.62 trillion) and the US ($40.72 trillion). With the slowdown in global trade recently and government deficit spending, China is expected to be a net debtor in 2019 per the FT and thus needs these new funds. Also, these flows will cushion the approximate $300 billion of bad debt (non-performing loans) held on bank books as foreign capital makes its way into the country. Conversely, other countries will face more competition for funding – China may have restrictive regulations but it does offer positive yields unlike the $10 trillion in negative-yielding government debt, primarily out of Europe. Growing US and Japanese deficits also are expected to strain bond markets at the same time that this reallocation is occurring. Watch yields as the knock-on effect from higher rates on the real economy (mortgages, auto loans) and the stock market could be wide-ranging. Aramco, the Saudi national oil company, filed the prospectus for a bond offering, which required the first official public view of its finances – with some big numbers indeed. The justification for the $10 billion in bonds is to help finance the 2020 purchase of the national chemical company, Saudi Basic Industries Corp, from the Saudi government. As big as $10 billion is, it is equal to about one month’s income in 2018… ONE MONTH’S INCOME. Not revenue! Last year, Aramco made $111 billion – even after paying $155 billion in royalties and taxes to the Saudi government. Obviously that number depends on the price of oil but that is not particularly high right now at $60 per barrel in the US. By comparison, $111 billion in profit is about double the profit of Apple ($59.4 billion). An amusing footnote stated that Aramco loses about 10,000 barrels of oil per day from leaks or evaporation. While only 0.1% of output, that amount is equal to about $200 million per year or about one supertanker in volume. Less amusing for the markets was the revelatory condition of Saudi Arabia’s largest oil field (actually at 174 miles long it is the largest conventional oil field in the world). Conventional wisdom had Ghawar’s maximum production pegged at 5 million barrels per day (mbpd) but per the prospectus it is actually about 3.8 mbpd, less than expected By comparison, the country’s two other mega-fields, Khurais and Safaniyah (the world’s largest offshore oil field) combined pump about 2.9 mbpd. Finally, Ghawar has about 48 billion barrels of oil left, about 34 years’ worth at the current pace of production. Saudi Arabia stated that it has about 226 billion barrels in reserve, about 52 years of production at an assumed maximum of 12 mbpd. Plenty of time to switch to electric cars or other technologies but a reminder of the inevitable transition off fossil fuels. OPEC oil production fell again in March to 30.4 million barrels per day (mbpd), reaching cuts of 1.1 mbpd or about 200,000 bpd lower than their target of 812,000 bpd. Furthermore, the April OPEC meeting was canceled so any official change in policy will wait until June. The Saudi reduction in March reached 9.9 mbpd, which is over 700,000 bpd below the cut baseline and twice as much as their pledge of 322,000 bpd. On the other hand Russian oil output declined to only 11.3 mbpd, still higher than their promise of five months ago. Oil minister Novak promised to reach his 228,000 bpd reduction mark in early April but in March he warned that he cannot keep cuts in place past September. Therefore, the world’s second largest oil producer has lagged in reaching their goal and will remain there a scant few months. Venezuela again saw production fall, declining by about one-quarter from 1.1 mbpd to 0.9 mbpd. US sanctions are having an effect on demand but more notably, the country is falling apart. In March widespread blackouts closed refineries and the country’s main export terminal, affecting 700,000 bpd of crude oil processing and idled ships. Money issues still plagued the government. Last month the World Bank ruled that the country owes ConocoPhillips more than $8 billion to compensate for the 2007 expropriation of oil assets by the country’s late socialist leader Hugo Chavez. Also, Russia has its claims of over $2 billion as well. Ah, the bitter fruit of corruption! 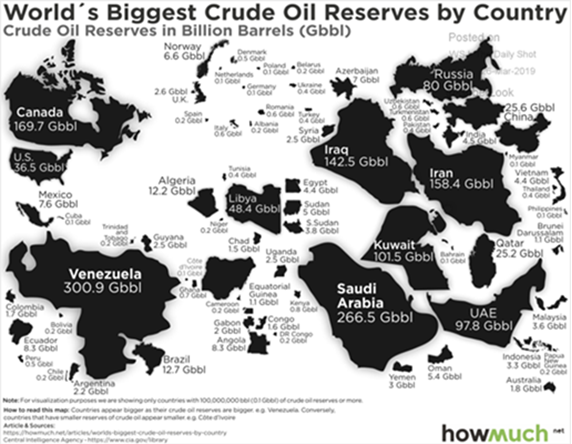 As per the graphic to the right, however, they still have the edge on estimated reserves over Saudi Arabia. Of course, that oil may just sit in the ground for a long, long time. Iranian exports remained steady to higher as US sanctions have worked what power they could or waivers may be granted. With over 3,000 dead due to massing flooding, the country has some other priorities right now. Mexico’s oil production in January fell to the lowest level since 1990 at 1.6 mbpd, trailing the 2018 average of 1.8 mbpd. Libya continued to rebuild its production to over 1.1 mbpd on the restoration of its El Sharara field, but its political situation became shakier as General Haftar who controls the eastern portion of the country ordered his troops to move on the capital Tripoli. While reportedly only 60 miles away, he faces determined opposition not just from the official government but also local militias, especially in Misrata and Sirte. Will he be able to intimidate his way into being in charge or will blood have to run? Finally, in more positive supply news, Mexico’s national oil company Pemex plans to triple the number of wells it will drill this year in a bid to reverse more than a decade of declining production. The plan involved drilling 506 new wells spread across 20 recently-discovered fields. For the sake of their economy and regional stability, we wish them every success. 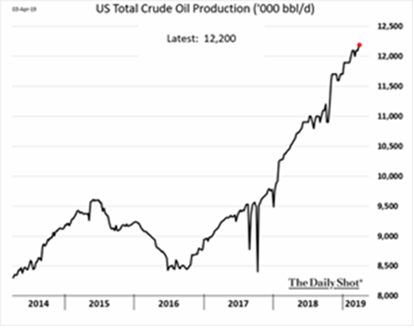 US crude production faltered but then ticked higher to 12.2 mbpd of crude oil but the decline of drilling rigs in operation continued from 843 as of March 1st to 816 as of March 29th. Output from seven major shale formations was expected to rise 85,000 bpd in April to a record 8.6 mbpd. Although April’s total, if accurate, would be a record high, the increase continues a pattern of shrinking gains since September. On the other hand, the shale boom drove the US to take the least amount of crude in three decades. 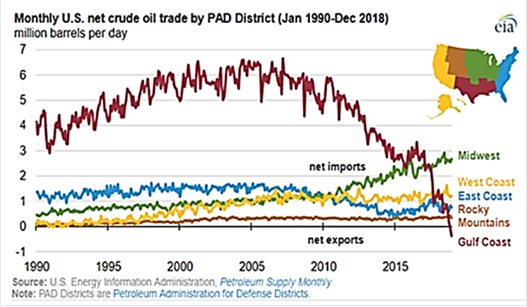 US oil exports continued their trend higher, reaching an average of 2 mbpd in 2018 which you can see in the below graph as the Gulf Coast has shifted from a large net importer (~6 mbpd) to a small net exporter. The region’s vulnerability to weather and accidents was on display however as a massive multiday petrochemical fire, related benzene cloud and oil spill near Houston halted vessel traffic for several days in March. As of the end of the month. 50 inbound and 28 outbound ships were still waiting to navigate the channel as traffic was about 35% of normal. included China restarting construction on more than 50 gigawatts of suspended coal-fired power plants – a little surprising given the smog / pollutions issues there. Deadly African Swine Fever (ASF) continued to spread in that country as stocks of breeding pigs in a major Chinese hog producing region plunged -41% in the seven months to February. Given that China produces almost half the world’s pork, this is a major food supply issue. Reportedly per the CME, China has killed 16-20% of their supply, nearly the same size as the entire US herd. While not capable of infecting humans, ASF is almost 100% fatal to the animals and has no vaccine or cure. Vietnam confirmed the spread of the disease to there, and in March US border agents seized one million pounds of Chinese pork snuck in ramen bowls and tide bottles over suspicions that it might contain ASF. Chinese infected pork was also smuggled into Australia in January. Meanwhile, China made its biggest purchases of US pork in nearly two years despite import tariffs of 62% imposed by China as a consequence of the trade war between the two countries. China also has recently bought US corn and soybeans but the total amounts are small compared to the pre-trade escalation. Meanwhile, Brazilian exports of soybeans and corn in the first quarter were larger than seen in the same period a year earlier, with Q1 2019 soy shipments about +30% higher than in 2018. China’s crude oil processing rate will likely hit another record in Q3 2019, topping 13.0 mbpd for the first time, as two new mega-refineries ramp up and others exit maintenance. Crude oil use in China, the world’s biggest importer, rose +6.1% from a year earlier to a record 12.7 mbpd in the first two months of 2019. Seems like that the Chinese will eventually want to get their hands on some of that US shale oil!